Martyn Hilbert's Railway Photography - Industrial Locomotives - Ex BR Class 02, D2867 at Redland Roadstone, Barrow-Upon-Soar. Ex BR Class 02, D2867 at Redland Roadstone, Barrow-Upon-Soar. 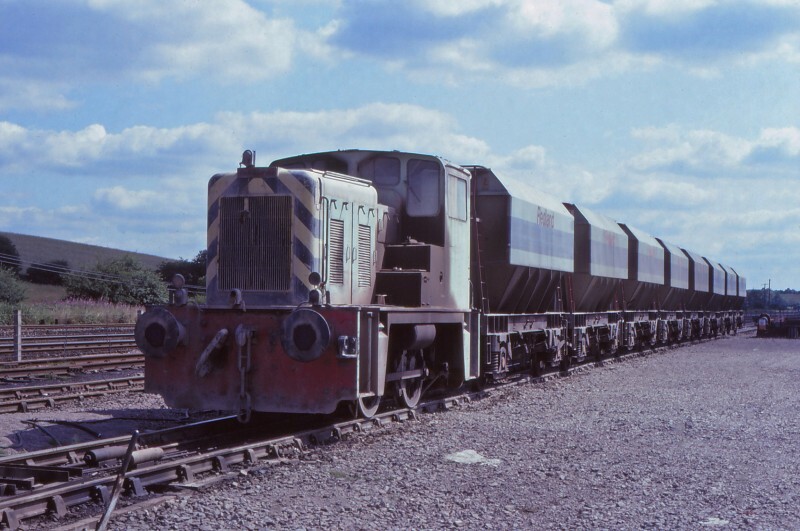 Former BR Class 02 diesel hydraulic 0-4-0 shunter, D2867 was one of the resident shunting locomotives at the Redland Roadstone sidings at Barrow-Upon-Soar on August 16th 1981. The loco was built by the Yorkshire Engine Company entering traffic in November 1961. Its first home was Bank Hall Liverpool, where the loco would have been employed at Great Howard Street Goods Yard near to Liverpool Exchange. During its 8 year BR career the loco drifted around various depots, including Lostock Hall during 1965/1966.